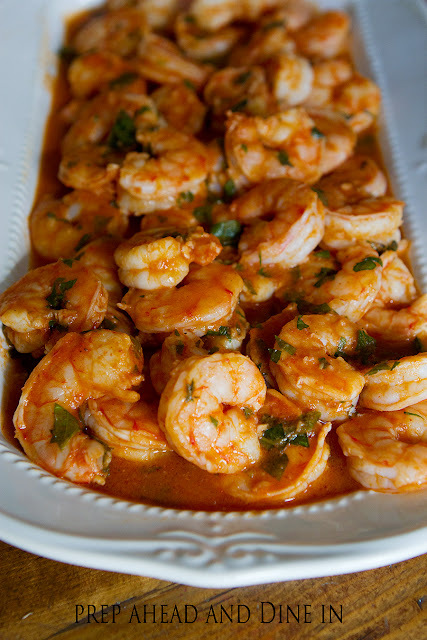 This shrimp dish has been a staple on Sunday afternoons since football season began! It’s a great appetizer that’s easy to prepare and doesn’t require two pounds of cheese like most of my favorite football foods! Although we have been generally trying to eat healthier, we are in no way foregoing some of our absolute favorite dishes including slow cooker queso blanco and Asian style wings!!! I see those in our near future for sure!!! We’ve been serving this shrimp as an app with a bowl of toothpicks on the side but it could just as easily turn into a nice light weeknight meal when served over rice or pasta with a steamed veggie on the side! Hope you like it as much as we do! Prep Ahead Plan: Prepare the entire recipe the night before or several hours before and keep it in the fridge until ready to bake. It tastes better when it has a few hours to marinate but it can be baked right away too. 1. Preheat oven to 400 degrees. Spray a 9 X 13 baking dish with cooking spray. 2. Mix the first 7 ingredients in the baking pan and mix well. Toss in shrimp and stir. 3. Refrigerate until ready to bake or bake for 20 minutes and serve! Copyright © PrepAhead and Dine In: Baked Tomato Basil Shrimp. All Rights Reserved.